When viewed as a whole the suburban landscape creates a fabulous pattern – the never ending front lawn surrounded by a herbaceous boarder, the single storey triple fronted brick veneer (or bungalow for UK readers), garden accessories and so on. The pattern is created by the entire landscape. Its not just the house. Its the house in its garden setting within its wider streetscape. Patterns are inadvertently developed by the builder of the decade. Rubber stamping designs across the rural-urban fringe creates visual cohesion. And visual cohesion is good. Even better if that pattern is considered to be of historical value. Heritage buffs love an intact heritage pattern. But why is the garden less important in these patterns. For some reason building patterns are not allowed to disrupt the streetscape but gardens can. 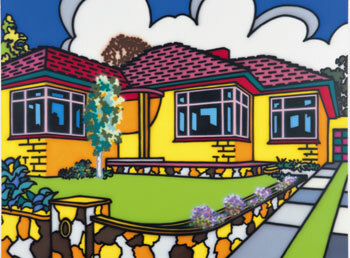 If I plopped an entire field of Eucalypts in the Howard Arkley picture below the streetscape is altered. The building becomes insignificant (from a streetscape perspective) – yet I could still not change the building.? Previous articleStreetscape and Garden Walls in London are lying. Urban designers move with your art culture. Next articleBye my super metal wall art sunburst fun – you were not really for unprotected garden walls .